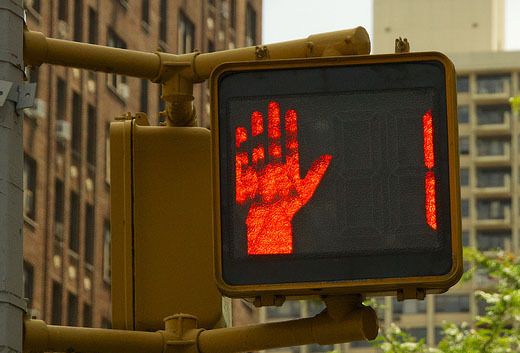 Those nifty countdown timers on most modern crossing lights certainly seem convenient for pedestrians: knowing how much time you have can help you hustle or let you relax your pace across an intersection. However, it turns out that they're actually increasing the number of accidents. Motorists surreptitiously use them to enable more second-shaving aggressive driving. One solution offered by researchers is to replace visible timers with audio-only timers, which pedestrians can hear but most drivers can't. A little less information just might make drivers a little less dangerous! I generally really like the countdown timers, but what bothers me is that some of them are honest - when it hits 0 the light actually changes - and some of them are not - when it hits 0, you still have plenty of time to cross. For the intersections that I regularly cross I know which is which, but when I'm at a new intersection it's still a guessing game as to how much time I really have. Interesting, I'd never noticed that some timers aren't quite honest - but I bet I'll notice them all the time now that you mention it!